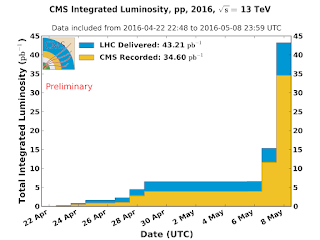 One interesting anomaly in the LHC run-1 was a hint of Higgs boson decays to a muon and a tau lepton. Such process is forbidden in the Standard Model by the conservation of muon and tau lepton numbers. Neutrino masses violate individual lepton numbers, but their effect is far too small to affect the Higgs decays in practice. On the other hand, new particles do not have to respect global symmetries of the Standard Model, and they could induce lepton flavor violating Higgs decays at an observable level. 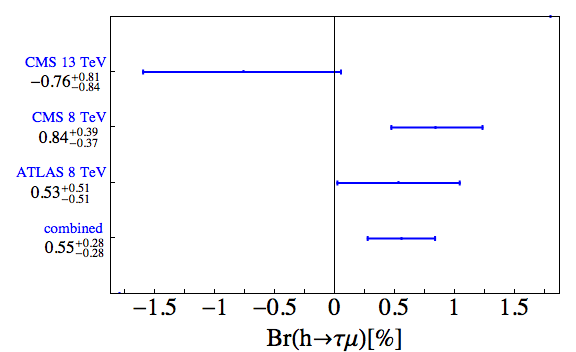 Surprisingly, CMS found a small excess in the Higgs to tau mu search in their 8 TeV data, with the measured branching fraction Br(h→τμ)=(0.84±0.37)%. The analogous measurement in ATLAS is 1 sigma above the background-only hypothesis, Br(h→τμ)=(0.53±0.51)%. Together this merely corresponds to a 2.5 sigma excess, so it's not too exciting in itself. However, taken together with the B-meson anomalies in LHCb, it has raised hopes for lepton flavor violating new physics just around the corner. For this reason, the CMS excess inspired a few dozen of theory papers, with Z' bosons, leptoquarks, and additional Higgs doublets pointed out as possible culprits. KamLAND-Zen is a group of buddhist monks studying a balloon filled with the xenon isotope Xe136. That isotope has a very long lifetime, of order 10^21 years, and undergoes the lepton-number-conserving double beta decay Xe136 → Ba136 2e- 2νbar. What the monks hope to observe is the lepton violating neutrinoless double beta decay Xe136 → Ba136+2e, which would show as a peak in the invariant mass distribution of the electron pairs near 2.5 MeV. No such signal has been observed, which sets the limit on the half-life for this decay at T>1.1*10^26 years. The neutrinoless decay is predicted to occur if neutrino masses are of Majorana type, and the rate can be characterized by the effective mass Majorana mββ (y-axis in the plot). That parameter is a function of the masses and mixing angles of the neutrinos. 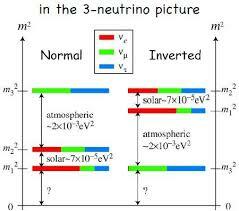 In particular it depends on the mass of the lightest neutrino (x-axis in the plot) which is currently unknown. Neutrino oscillations experiments have precisely measured the mass^2 differences between neutrinos, which are roughly (0.05 eV)^2 and (0.01 eV)^2. But oscillations are not sensitive to the absolute mass scale; in particular, the lightest neutrino may well be massless for all we know. 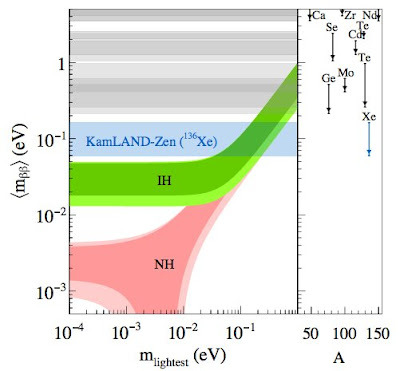 If the heaviest neutrino has a small electron flavor component, then we expect that the mββ parameter is below 0.01 eV. This so-called normal hierarchy case is shown as the red region in the plot, and is clearly out of experimental reach at the moment. On the other hand, in the inverted hierarchy scenario (green region in the plot), it is the two heaviest neutrinos that have a significant electron component. In this case, the effective Majorana mass mββ is around 0.05 eV. Finally, there is also the degenerate scenario (funnel region in the plot) where all 3 neutrinos have very similar masses with small splittings, however this scenario is now strongly disfavored by cosmological limits on the sum of the neutrino masses (e.g. 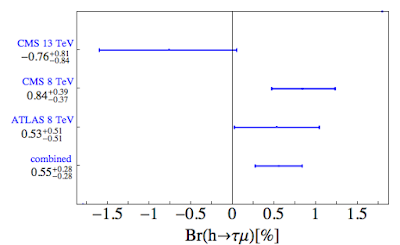 the Planck limit Σmν < 0.16 eV). As can be seen in the plot, the results from KamLAND-Zen, when translated into limits on the effective Majorana mass, almost touch the inverted hierarchy region. The strength of this limit depends on some poorly known nuclear matrix elements (hence the width of the blue band). But even in the least favorable scenario future, more sensitive experiments should be able to probe that region. Thus, there is a hope that within the next few years we may prove the Majorana nature of neutrinos, or at least disfavor the inverted hierarchy scenario. The LHC is back in action since last weekend, again colliding protons with 13 TeV energy. The weasels' conspiracy was foiled, and the perpetrators were exemplarily electrocuted. PhD students have been deployed around the LHC perimeter to counter any further sabotage attempts (stoats are known to have been in league with weasels in the past). The period that begins now may prove to be the most exciting time for particle physics in this century. Or the most disappointing. By the end of October, when the 2016 proton collisions are scheduled to end, the LHC hopes to collect some 20 inverse femtobarns of data. This should already give us a rough feeling of new physics within the reach of the LHC. If a hint of another resonance is seen at that point, one will surely be able to confirm or refute it with the data collected in the following years. If nothing is seen... then you should start telling yourself that condensed matter physics is also sort of fundamental, or that systematic uncertainties in astrophysics are not so bad after all... In any scenario, by December, when first analyses of the full 2016 dataset will be released, we will know infinitely more than we do today. So fasten your seat belts and get ready for a (hopefully) bumpy ride. Serious rumors should start showing up on blogs and twitter starting from July.